What Lurked Near the Banks of The River of Doubt? 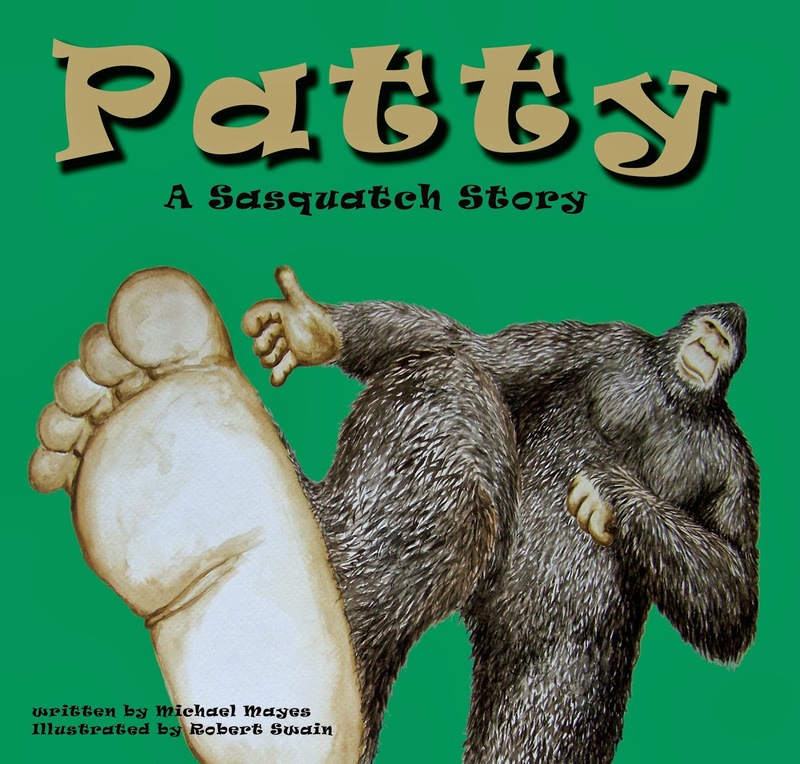 Most people who are interested in cryptozoology, and in particular bigfoot, are familiar with one of President Theodore Roosevelt’s favorite campfire stories. 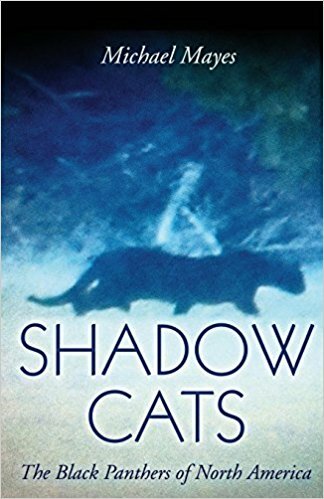 I am referring, of course, to the story of the two trappers who encountered a vicious beast of some kind in what is now Idaho. A beast with a strong odor and that, seemingly, walked on two feet. One of the trappers was allegedly killed by the beast, while the other, a man named Bauman, left the area never to return. According to Roosevelt’s telling, published in his 1893 book The Wilderness Hunter, Bauman himself related the experience to the future president. 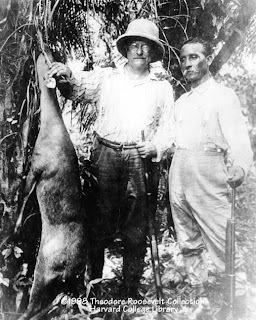 It is an interesting story and it isn’t hard to imagine Roosevelt telling and embellishing this tale to his hunting buddies while sitting around a roaring campfire. You can read the story here. While the Bauman story is considered a classic in the annals of sasquatch lore, this post deals with another tale involving Roosevelt. In addition to the strange sounds it was noted that the forest would sometimes go completely silent when the maker of these strange cries and knocks was in the vicinity. This, again, is something we have heard from alleged sasquatch witnesses. 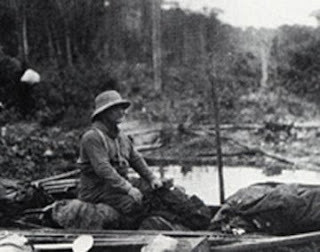 Veteran outdoorsman George Cherrie, of the American Museum of Natural History, and a specimen collector on the Roosevelt expedition, noted how the screams, crashes, clangs, and cries of the forest seemed to terrify the other more common animals of the jungle. This was perhaps the most disturbing thing about the noises to the members of the expedition. Cherrie wrote, “Let there be the least break in the harmony of sound and instantly there succeeds a deathlike silence, while all living things wait in dread for the inevitable shriek that follows the night prowler’s stealthy spring.” While the great hunter and adventurer, Roosevelt, feared little, even he admitted to trepidation and a sinking feeling when darkness descended and the strange maker of the screams and other noises was in the area. 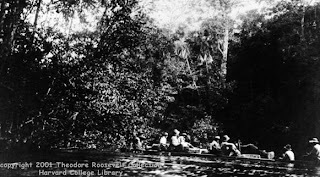 While the words above were not Roosevelt’s, they described closely sounds he, and the rest of the men heard many times during the rainy season of 1914. The words used by Bates to describe what he heard sound startlingly like descriptors used by hunters, campers, hikers, and naturalists in North America who have heard knocks, clangs, howls, and screams they cannot attribute to any known animal. Certainly there is absolutely no proof that what Theodore Roosevelt heard in the wilds of the Amazonian rain forest could be attributed to South America’s version of the sasquatch. Similarly, it has yet to be proven that wood knocking and strange howls and screams heard in the deep woods of North America are attributable to the sasquatch. I simply found the parallels between Roosevelt’s experiences, my own experiences, and those of many people I’ve met interesting. It is argued by many that auditory reports aren't worth very much. After all, people are not sent to prison by "ear" witness testimony. Also, it would be pretty arrogant to assume we know all the sounds documented animals make. Therefore, it may be more logical to assume a known animal is responsible for these strange knocks. 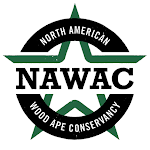 Until someone sees and videos a sasquatch making these wood-knocking sounds it remains pure speculation, despite a growing body of circumstantial evidence, that an undocumented primate is responsible for them. The screams and howls, in my opinion, are more problematic to explain as a known animal. At times the sheer volume, and the lung capacity needed to produce it, would seem to eliminate known species. However, again, there is no definitive proof that the sasquatch is responsible for these howls and screams. These phenomena are just tantalizing tidbits at the moment. It is my hope, however, that these strange howls, knocks, clangs, etc. will one day help lead us to the zoological discovery of our lifetime. So, what did Theodore Roosevelt hear in the Amazonian rain forest in 1914? I have no idea. The interesting thing is that neither did he. Good news for The Big Thicket of SE Texas. According to news reports, the National Preserve will be growing by 6,600 acres. This new addition is located just north of Beaumont and was acquired using donated funds from private businesses and foundations and monies collected from environmental fines by the U.S. Attorney's Office. The new territory is a great wetland area made up mostly of swamps, creeks, and slow moving bayous. This is great news for all wildlife in the area. 6,600 acres is not a massive tract of land but it is a pretty good chunk that will help insulate interior areas of The Big Thicket Preserve. See the article below for full details. BEAUMONT, Texas (AP) — When Pete Gunter took a boat tour of the Big Thicket's latest land acquisition recently, he saw concrete results of years of work and struggle by a core group of supporters. 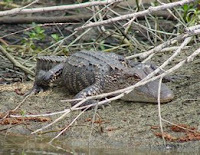 He also saw economic opportunity lurking in the freshly greened cypress trees, slow-moving bayou waters and assorted wildlife — including wading birds and a sunning alligator. Gunter, Big Thicket Association past president and author of books about the Neches River, marveled at the beauty of the Southeast Texas swamps around Beaumont. "It just isn't getting out — it's Texas' best kept secret," he said. Gunter firmly believes that if the rest of the world knew what the region had to offer in terms of scenic beauty and outdoor sporting opportunities, it would beat a path to the region. "You've got one boat — you should have six and they should be serving meals," he said. The "one boat" to which Gunter referred was the Cardinal Neches River Adventures vessel transporting about 30 Big Thicket supporters, cheerleaders and employees on a tour of a newly acquired tract on the east side of the Neches River just above Interstate 10. The U.S. Parks Service and The Conservation Fund were celebrating the addition of the 6,600-acre parcel. The Conservation Fund acquired the land through donations and funding from a variety of private businesses and foundations, as well as environmental fines from cases prosecuted by the U.S. Attorney's Office. They then turned the tract over to the Thicket. As the boat glided slowly and quietly up 10-Mile Creek amid jumping fish and lurking gators, the Fund's Julie Shackleford expanded on some of the amenities the new addition would bring to the region. While the lower portion of the tract consists mainly of swamps and bayous, the higher elevation Houseman property, near the confluence of the Neches and Village Creek, should have good prospects for hiking trails. Wetlands and bayous, most of which is not really well suited for hiking, nonetheless provide excellent canoeing and kayaking opportunities. 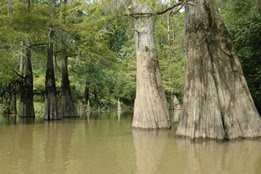 Shackleford said a book coming out in the fall, "The Neches River Users' Guide," will profile the meandering waterways branching out from 10-Mile Creek and should attract boaters to the Thicket. Gunter said an important part of developing ecotourism businesses will be partnering with local government. "One reason I came down here today was to talk to the mayor of Beaumont about economic opportunities (in the Big Thicket)," he said. As timber and oil cease to be the major part of the economy they once were, he added, the land they once used is left vacant. Gunter said he did not want to imply that ecotourism could solve the region's economic woes — but it could be a significant part of a diversified economy that would enhance the quality of life in Southeast Texas at the same time it generated revenue. Others on the tour spoke of the importance of wetlands to the region for flood control and as a stopping-off point for migrating wildlife, a situation that creates another ecotourism market. Gunter said the next few years will be crucial for the preserve. As timber companies have divested themselves of their land holdings, the property is ripe for development. It is important for the Big Thicket to acquire more land along its outer edges to preserve the wild character of the preserve. "You don't have much of a wilderness experience if you can see the Lake of Fire Tanning Salon from the hiking trail or the campsite is next door to Bubba's All American Digital Carwash," Gunter said. Below is a recording, posted in video form on YouTube, that seems to indicate that a train engineer has spotted a sasquatch walking on or near the tracks. I don't know much about this other than the event allegedly occurred near Blair, Nebraska. I have no idea if it is a hoax or not. The fact that it was posted on YouTube automatically makes it dubious in my eyes but you never know. If anyone knows anything more about this I would appreciate any additional information. I have discussed with some of my fellow TBRC members on more than one occasion that I would like to identify and speak to two groups of folks regarding possible bigfoot sightings in East Texas. The first group would be the folks who mow and keep the pipeline right of ways, or senderos, clear of debris. These pipeline cuts run for literally mile after mile through some of the most remote portions of the lone star state. The second group of folks I would like to visit with are the engineers who drive the trains through East Texas. Like the pipeline senderos, the train tracks cut through some pretty isolated and lonesome areas and are often the only clear path through miles of forest. If anyone out there is employed in either of these vocations I would greatly appreciate your contacting me at the email address to the right. A fellow I work with related an interesting story to me a couple of weeks ago. He had just found out I was from east Texas and that I really enjoy bass fishing. He had traveled to Toledo Bend Reservoir on the Texas/Louisiana border on his spring break a few years ago. His plan was to fish the lake hard every day for a week in search of a trophy large mouth. His third day on the water he was fishing an area not too far from the Mid-Lake Campground. He’d had some luck in this area the previous day; he had pulled several 2-3 pound fish out and had hooked something large that broke him off on a submerged stump before he got a chance to see it. He had returned to see if he could coax this potential trophy to bite again. As he trolled quietly into his target area he spied a large lay down he had missed the previous day. The log lay in about three feet of water and seemed to be an ideal spot for a hungry bass to be lurking. He flipped his spinner bait past this target, reeled it up so as to bump the log, and then let the lure flutter down to the bottom before slow rolling it back toward the boat. He made a dozen or so casts to this log without getting bit. He was ready to move on but decided on one more cast. However, as he prepared to make his cast the “log” flipped a massive tail and slowly swam away. He sat stunned as a massive alligator gar cruised out of site. “That was the biggest fish I’ve ever seen. It had to be nine or ten feet long and two and a half to three feet thick”, he said. I won’t exaggerate the extent of my relationship with this gentleman. I really don’t know him very well but he doesn't seem prone to exaggeration. However, even if he is off a bit on the size of the gar he saw it must have been massive. After all, the man actually made casts to it thinking it was a log. The alligator gar is a fearsome looking pre-historic fish with a head full of razor sharp teeth that is prevalent through out the south. It commonly reaches lengths of six feet or more and can weigh in excess of three hundred pounds. It is easily the largest fresh water fish in this part of the country. A few stories of attacks on humans float around from time to time but they are dicey accounts at best. The alligator gar does not see humans as prey. Rather, most injuries result from fishermen trying to haul in a big gar. A large gar can inflict a pretty serious bite while thrashing about on the floor of a boat. 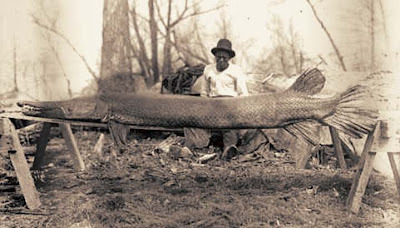 The largest alligator gar on record is a 350 lb. behemoth taken in the 1930s from the Saint Francis River in Arkansas. Rumors of larger gar persist, however. 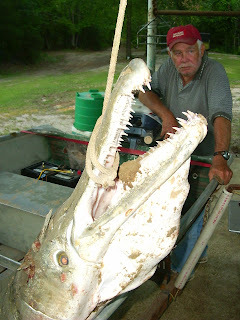 The bayous of Louisiana and several reservoirs in Texas are said to hold incredibly large fish. The Trinity River just east of Dallas is also a hot spot for serious fishermen seeking big gar. Some of the tales about these monsters are as interesting as those of the alleged giant yellow catfish said to haunt the deepest portions of some southern reservoirs. I suppose the alligator gar is not a cryptid in the truest sense. After all, it is a documented species. 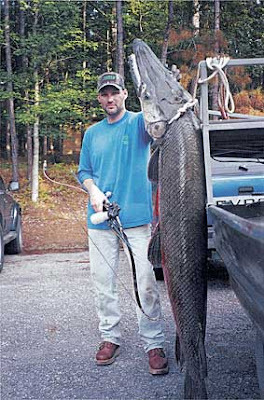 However, it is possible that truly giant gar, if they really exist, could turn out to be a new sub-species. True cryptid or not, I am fascinated by truly giant fish. I will post any reports or photos I come across of these awesome looking fish. In the meantime, if you’ve encountered a truly big gar let me know about it. I would like to post your story and pictures.